The Braves were already up 1-0 in the first inning. Brian Hunter quickly made it 3-0, with a home run. It was Game 7 of the 1991 National League Championship Series, a game the Braves went on to win by the score of 4-0. The fourth run also came off Hunter's bat, thanks to a double. "I think he tried to sneak a fastball over," Hunter told The Pittsburgh Post-Gazette later of his first-inning home run off the Pirates' John Smiley. "I just hit it as hard as I could." Hunter hit that home run near the end of his first season in the majors. He'd just debuted with the Braves May 31. Hunter went on to play in parts of nine big league seasons, and in three World Series. 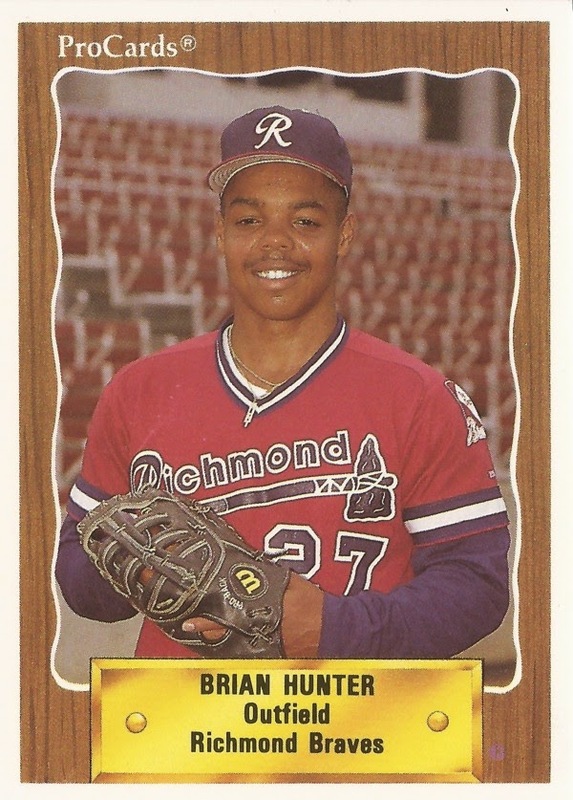 Hunter's career began in 1987, taken by the Braves in the eighth round, out of Paramount High School and Cerritos College in California. Hunter played that first year at rookie Pulaski, making AA Greenville in 1989. He made AAA Richmond in 1990, then Atlanta the next May. In Hunter's first 16 big league games, he hit four home runs. The fourth came June 21, in a game where Hunter knocked in all four Brave runs in a 4-2 win. "The kid can really hit the ball," Braves manager Bobby Cox told The Associated Press after that game. "He was hot before we brought him up from Richmond and he's still hot." Hunter hit .251 in 97 games that first year, along with 12 home runs. Hunter hit that NLCS home run, and another one in a 14-5 Braves Game 5 World Series win. Hunter got into another 102 games in 1992, another Braves World Series run. In that year's series, Hunter got just one hit in just five at bats. In 1993, Hunter got into just 37 games all year, the first baseman losing time to Sid Bream and Fred McGriff, The AP wrote. The Braves then sent Hunter to the Pirates for 1994, the team he helped beat in 1991. The Pirates were happy to have him, Hunter was happy to go, The AP wrote. Hunter simply wanted to play. "I've been to two World Series, but I didn't play everyday and I've learned that baseball isn't all about winning," Hunter told The AP in March. "It's not all about money. It's about playing, and I want to play." With the Pirates, Hunter got into 76 games, hitting no better. He hit .227. By the end of July, the Pirates sent Hunter to the Reds. He got into nine games with them before the strike came. Hunter returned for 40 games with the Reds in 1995, moved to Seattle in 1996 and spent all of 1997 in the minors back with the Reds. After playing with the Cardinals in St. Louis in 1998, Hunter returned to the Braves for one more season in 1999. He also got into another World Series with the Braves that October. In Game 1, though, Hunter came into the game in the eighth and quickly made two errors as the Yankees scored four runs. He'd made a total of four errors in 101 total games in the regular season, The New York Daily News wrote. Hunter returned for one more season, in 2000, two games with the Braves and 85 more with the Phillies. Two more seasons in the minors, at AAA Syracuse and AAA Durham, ending his career.